Lazy financial writers like to say that higher bond yields will hurt dividend stocks. This blanket statement may sound reasonable, but it’ll cost you money if you take it at face value. Pundits have called sleepy dividend stocks like General Mills (GIS) “bond proxies” in recent years. GIS has paid 3% (more or less) over the last three years. That compared favorably with the 10-year note, which paid 2% (more or less) over that time period. Who the heck was buying GIS for an extra stinking percent per year? But what does GIS have to do with dividend growth tomorrow? Not much. Remember, share prices tend to move higher with their payouts. So there’s a simple way to maximize our returns and hedge against higher interest rates: Buy the dividends that are growing the fastest. There’s also a simple way to put your entire retirement at risk: Buy the dividends that are running on fumes and in danger of being cut. Here are five more blue chips selling the products of yesteryear. Time has passed them by, and their payouts may be living on borrowed time. Dicey dividends mean these five stocks have serious downside risk from here. 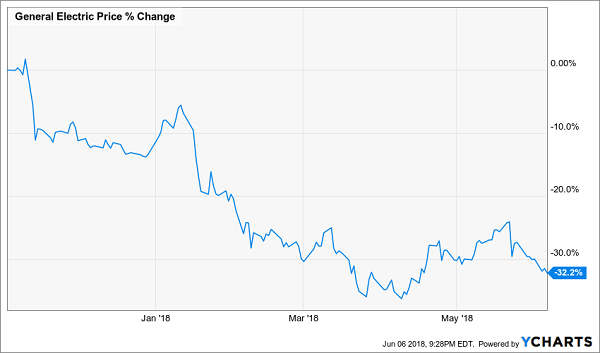 General Electric (GE) cut its dividend in half less than a year ago, and yet it’s still yielding more than 5% at current prices. A dividend cut is never a good sign, but it doesn’t always mean disaster. 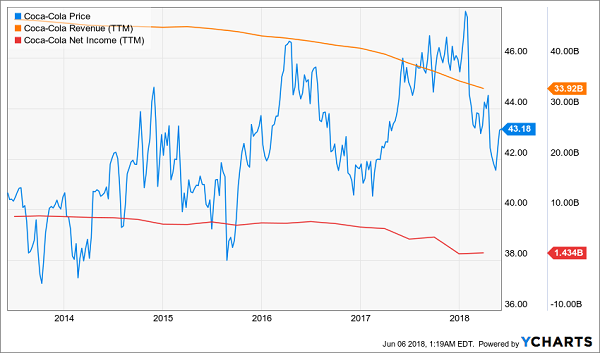 In a few cases – BlackBerry (BB) comes to mind – a company makes a calculated decision to preserve cash because it has a plan and needs all the cash it can to survive and make that plan work. But in General Electric’s case, it’s hard to determine exactly what’s going to happen. The turnaround plan unveiled in 2017 emphasized the need to focus on a few core businesses instead of keeping its sprawling operations. But there’s still no clear path as to whether GE will spin off any of its divisions or sell them off. 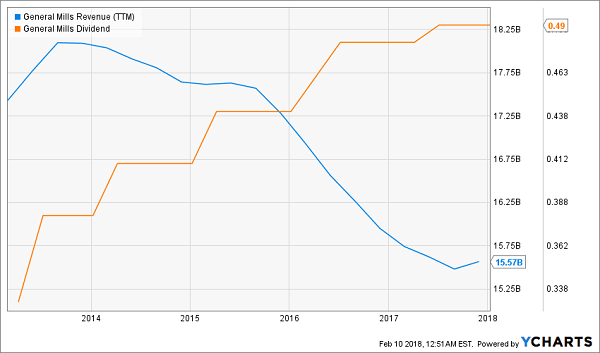 GE might offer more than double the yield of a high-end savings account, but right now, that payout seems about as secure as a snowball in Tuscon. Kraft Heinz (KHC) seemed destined for consumer-staple greatness. After all, it had Warren Buffett on the board and also was backed by private-equity group 3G Capital. It was also going to buy up consumer giant Unilever (UL) in what would’ve made it one of the sector’s most formidable powerhouses. Then things started to unravel. Kraft’s $143 billion bid for Unilever was ultimately rebuffed in 2017. Then in April, the Oracle of Omaha stepped down from the board of the company in which Berkshire Hathaway owns a 27% stake. All the while, KHC has a significant growth problem. Also concerning is Kraft Heinz’s dividend, which is well covered if you look at the traditional payout ratio that factors in net income. 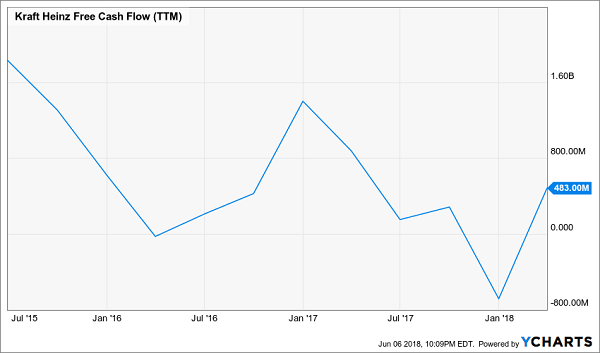 But if you factor in free cash flow – how much real cash a company generates once it has paid the cost of maintaining and growing its business – you get a much different picture. KHC has generated roughly $463 million in FCF during the trailing 12 months, yet with its newly raised 62.5-cent dividend, it’s on track to spend about $3.6 billion on dividends annually. Lackluster growth plus a low-watt cash situation has me skeptical about KHC’s chances to meaningfully grow its payout going forward, and to meaningfully reward shareholders. 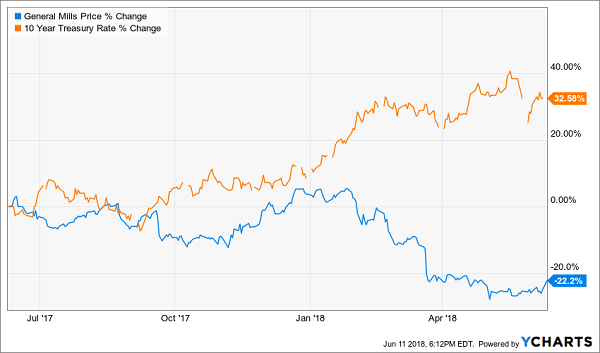 I beat up on Coca-Cola (KO) from time to time because it’s another perfect example of a stock where negative trends are clearly playing themselves out both in corporate results and in share prices. The maker of Coca-Cola, Coke, Minute Maid orange juice and Dasani bottled water was, for a long time, an unstoppable titan of growth as first the U.S. and then the rest of the world fell sway to its delicious sugary drinks. It attracted Warren Buffett’s attention all the way back in 1987, when he first added it to his Berkshire Hathaway (BRK.B) portfolio. And it’s still a Buffett favorite today – his $17.2 billion in KO stock is Berkshire’s fifth-largest holding and represents a 9.4% stake in the company. But remember: Buffett is sitting on one heckuva cost basis, and what he’s reaping in dividends is surely more than the so-so 3.5% on offer today. New money doesn’t have nearly the enticement given what’s happening in the sugary-drinks business. Carbonated soft-drink sales grew by a thin 1.3%, or about $1 billion in value, last year. But to the soda industry, that was reason to break out the Dom – it stopped a 12-year slide in soda sales that had pummeled the likes of Coca-Cola and rival PepsiCo (PEP). And to its credit, Coca-Cola was a big part of that resurgence, with a retooled lineup of Diet Coke products finally landing with Millennials thanks to new fruit flavors. But I expect the rebound to be temporary in nature. Much bigger trends are working against KO, including cities starting to treat sugary drinks like tobacco was in the earliest years of civic pushback. Slowly but surely, soda taxes are creeping onto ballots, with Philadelphia already passing one (to mixed results). Also, health studies continue to flip back and forth on whether diet sodas really are any better for people than full-calorie drinks – a recent Purdue review of a dozen studies resulted in a report that the fake sugar used in these drinks come with their own problems. Shares have been essentially flat since 2013, and the resurgence in Diet Coke has done little to change that narrative. Meanwhile, dividend growth has slowed to a glacial pace. There’s no reason a “high-yield” savings account can’t go toe-to-toe with KO for the next decade. Coca-Cola (KO): No Fizz. Just Flat. 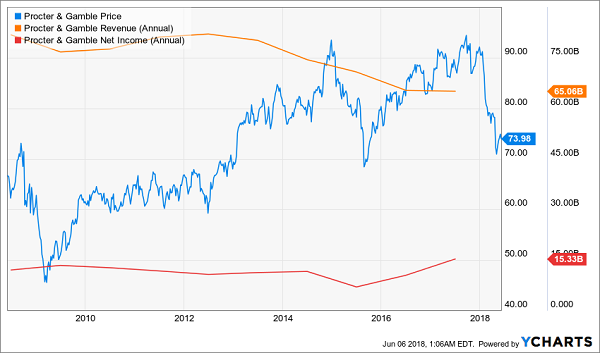 Procter & Gamble (PG) is among the longest-tenured Dividend Aristocrats in the game, recently declaring its 62nd consecutive annual dividend increase. The company has been paying a dividend for even longer, with a track record of regular income that dates back 128 years. Procter & Gamble celebrated the occasion by really putting down the pedal on its payout … with a 4% uptick. Of course, just about anything would look generous compared to last year’s 3% increase. The maker of Charmin toilet paper, Tide laundry detergent and Dawn dishwashing detergent owns a massive stable of billion-dollar brands that are popular the world over. But the company became too unwieldy for its own good, and now it’s trying to right-size by both cutting bait with less successful brands, as well as cutting costs to find its way to tidier profits. And believe it or not, Procter & Gamble is even a potential target for retail-killer Amazon (AMZN). Yes, P&G doesn’t actually operate brick-and-mortar shops, and in fact, you can actually find the company’s brands on the e-commerce site. But Amazon is delving into the world of private-label products, and once it starts focusing its marketing might there, that should cut into the more expensive labels under the P&G umbrella. In many ways, it should be no surprise that cigarette maker Altria (MO) – the American tobacco company behind brands such as Marlboro cigarettes, Black & Mild cigars and Skoal smokeless products – has a lackluster future. After all, the U.S. has been cracking down on smoking for many years now. In New York City, a bill has been introduced that would fine people for smoking while walking on city streets. In Rowan County, North Carolina, county commissioners recently voted to ban smoking in public outdoor parks. Augusta, Georgia, recently voted in an extension to the city’s smoking ban that now includes bars, other public places, and even in vehicles owned, leased or operated by Augusta. That’s unsurprisingly weighing on results. Altria is becoming a master of squeezing more income out of flatting revenue, growing profits 36% on a marginal improvement in sales for its fiscal first quarter. But you can only squeeze a stone so much, and otherwise, growth is not nigh. Analysts expect just 1% or 2% top-line growth for the next couple of years, and in that same Q1, domestic cigarette shipment volumes actually fell 4.2%. These weak results are really starting to weigh on shares, which have fallen to the point that they’re essentially dead money since 2016 – its fat dividend included. Also, I know that the prevalent “next great hope” for tobacco companies is eventually transitioning from Big Tobacco to Big Tobacco & Marijuana. But despite all of the legislative progress for weed, Altria and other Big Tobacco companies haven’t taken the initiative – there has been little in the way of aggressive positioning via acquisitions, or even organic movement. So don’t expect marijuana to come to the rescue anytime soon. 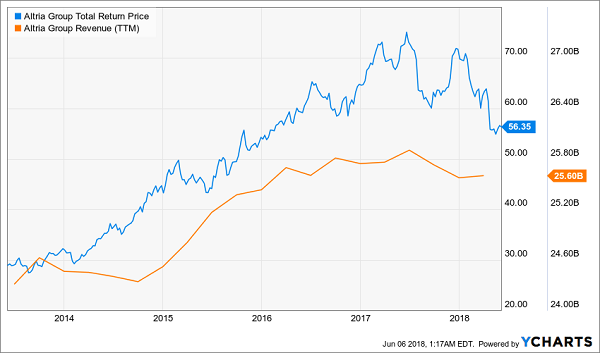 I expect each of these blue-chip stocks to lose investors money over the next five to 10 years – but even if they manage to hurdle over my low bar and simply stay flat, they’ll still provide only about 4% in dividend-cash returns every year. That might be better than a “high-yield” savings account, but that’s still a one-way ticket to the retirement poorhouse. You have to do better. And you can with my 8%-yielding “No Withdrawal” retirement portfolio, which offers double the yield on most investors’ basic rosters of overbought, underperforming blue-chip picks. 3.) Capital appreciation potential, because so many investors overlook the importance of actually growing their nest eggs in retirement. The low-yield math is depressing. 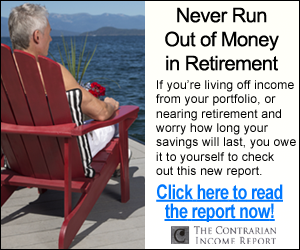 A 4% yield on your retirement portfolio will deliver just $20,000 annually from a $500,000 nest egg. That’s less than your local coffee shop barrista banked last year! My “No Withdrawal” portfolio will ensure that you can cover the monthly bills without having to cut back and settle for a second-rate retirement. This all-star portfolio allows you to collect an 8% yield, while growing your nest egg – something that ensures that if one of life’s big surprises strikes, you can cover the expenses without sacrificing your regular paychecks down the road. Massive dividends no lower than 6%, and a few that creep into the double digits. Dividend growth that will keep you well ahead of inflation. You’ve worked for decades to secure the comfortable retirement you so richly deserve. Let me show you how to make the most of your hard-earned cash. 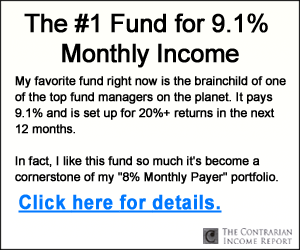 Click here and I’ll provide you with THREE special reports that show you how to build this “No Withdrawal” portfolio. You’ll get the names, tickers, buy prices and full analysis of their wealth-building potential – and it’s absolutely FREE!